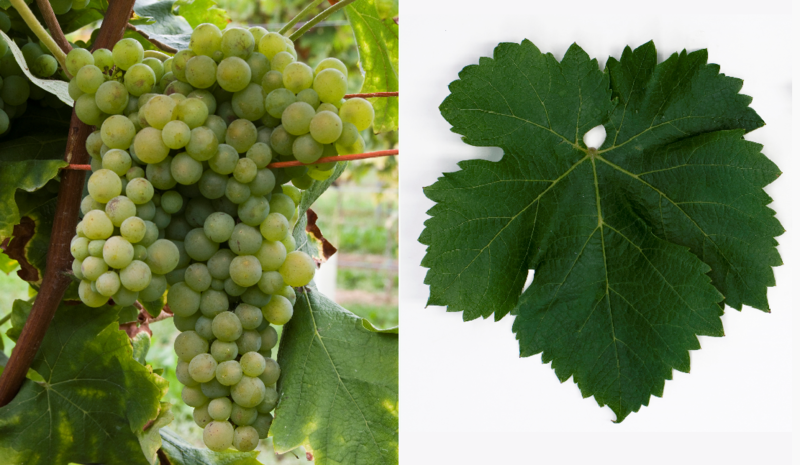 The white grape comes from Italy, Synonyms are Angelica, Boschera, Boschera Bianca, Duropersico, Lugana, Maggiore, Marchigiano, Mazzanico, Niuivres, Peloso, Pevarise, Peverella, Peverenda, Peverise Bianco, Pfefferer, Pfeffertraube, Pievana, Terbiana, Trebbiano di Lonigo, Trebbiano di Lugana, Trebbiano di Soave, Trebbiano di Verona, Trebbiano Nostrano, Trebbiano Valtenesi, Trebbiano Verde, Trebbiano Veronese, Turbiana, Turbiano, Turviana, Uva Marana, Verdetto, Verdicchio, Verdicchio Bianco, Verdicchio Dolce, Verdicchio Doratel, Verdicchio Doratello, Verdicchio Giallo, Verdicchio Marchigiano, Verdicchio Marino, Verdicchio Peloso, Verdicchio Sroccarello, Verdicchio Seroccarello, Verdicchio Straccione, Verdicchio Stretto, Verdicchio Verdaro, Verdicchio Verde, Verdicchio Vero, Verdicchio Verzello, Verdone, Verdurella, Verdusca, Verduschia, Verdusco and Verzello Verde. According to an unverifiable hypothesis, the origin can be said to date back to the time of Etruscan traced. According to another hypothesis, she (and other varieties) is a descendant of the ancient Aminea be that of the Roman authors Columella (1st century AD) and Pliny the Elder (23-79 AD). And according to legend, before the conquest of Rome in 410, the Visigothic King Alaric (370-410) strengthened his army with this wine. The certainly very old variety probably comes from Veneto and was in the 15th century in the Brands introduced. A variety called "Verdicchio" was mentioned by the naturalist Costanzo Felici (1525-1585) in Marche 1569. Especially in the 1950s and 1960s Verdicchio wine was also known outside Italy. The trading company Fazi-Battaglia introduced an amphora-like bottle with a scroll on the bottleneck in the early 1950s. This contributed (wrongly) to a negative image. There was hardly an Italian restaurant in many European countries that did not use the kitsch fishing nets and Verdicchio bottles in its interior. The medium to late ripening vine is prone to both mildews, as well as especially for Botrytis and bunch rot, It produces acidic white wines with aromas of lemons, apples, peaches and bitter almonds with aging potential, which are also suitable for the production of sparkling wine. The Italian acreage amounts to a total of 3,526 hectares of vineyards. In small quantities, it will also be in overseas Argentina (2 ha), Brazil (4 ha) and in the USA ( California ) grown. Compared to the year 2000, at that time 5,043 hectares, there was a reduction of about one third. The variety occupied in 2010 a total of 3,532 hectares of vineyards. It is thus worldwide varieties ranking on the rank 134. This page was last modified at 27 March 2019 at 17:47.